Writing an unnecessary NTF creates a metaphorical neon sign pointing inspectors and auditors toward areas of concern. 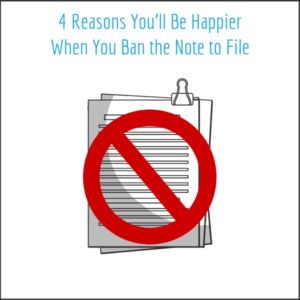 When weighing the risks and benefits of writing a note to file, consider that regardless of its content, an NTF will draw greater attention to that part of the TMF. It’s always worth pausing to explore if another format is more appropriate than the NTF for the message you’re trying to convey. In most cases an alternative format will be more effective and less risky. Have you written the same note to file dozens of times? Are placeholder and missing document NTFs filling up your TMF and making it difficult to locate the document you need? These self-evident and content-devoid NTFs can make a story more incomplete than if they weren’t written at all. Time and money spent to generate a meaningless NTF is time and money spent in opposition of your most essential TMF goals. Your TMF brings together thousands of document stakeholders from across the country or the world. Unfortunately, due to the pressing issues of day to day trial conduct, TMF challenges can grow unnoticed, only to become a catastrophe before a TMF’s closure. The result of TMF procrastination is a flurry of NTFs at the end of a trial – and a period of stress, blame, and disharmony among TMF stakeholders. By eliminating the crutch of the NTF, your team encourages a culture which proactively collaborates on TMF risks and challenges – before they grow into a catastrophe. In most cases, an NTF is written too late to meaningfully impact a problem. To be a valid component of a TMF, the NTF must fully define the problem and solution. The solution presented must also include a root cause analysis that fully characterizes the causative factors which led to the initial problem. NTFs rarely contain evidence of these due diligence activities as most NTFs act as a ‘substitute’ for them. By banning the NTF, your team can focus on prospective risk management activities, and when problems do arise, the focus will be on corrective action. Banning the NTF, however, is only the first step toward a brighter TMF future. At LMK, we are eyeing 2019 as the year for your digital transformation. Digital transformation means fully leveraging the tools of your modern eTMF system through fresh thinking about clinical documentation processes. By embracing digital transformation, you’ll be one step closer to achieving the risk-based and metric-driven eTMF regulators now expect. Contact us today to start your TMF’s transformation. We’re excited to learn more about your organization’s specific TMF challenges and goals. We want to be a central part of your 2019 TMF success.